Biomass briquetting machine converts biomass or other green waste into useful briquettes. Radhe Industrial Corporation is the leading and well known manufacturer of briquetting plant or biomass briquetting machine since 21 years. We are using latest technology to manufacture briquette press. 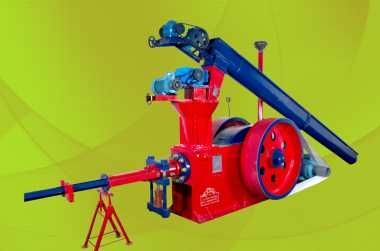 Briquetting equipment like, Jumbo 90 briquette machine and Super 70 briquette machine is manufactured by RICO. The output product briquettes are Eco friendly and used in various industries. The Radhe Industrial Corporation is the leading and experienced manufacturer of the biomass briquette plant and its equipments since 1991. Our quality products are Jumbo90 briquette machine, Super 70 briquetting machine and other briquetting plant machineries with latest technology.